The whole thing would've been nicer, though, if the female talent on the ramp were still in-character. They more or less knew this was coming, right? Some producer would've given them a heads-up at least a few minutes before the show went live. It was a bit jarring seeing Carmella and Asuka so close to each other, without Asuka foaming at the mouth with murderous intent and with Carmella looking less of a terrible opportunistic heel and more of an actual person. This was just a tiny detail, of course, but it could've gone a long way. Speaking of going a long way, they're going to crown the first ever WWE Women's Tag Team Champions during this PPV, right? With all of the women's division titles up for grabs, why not further the history-making with that icing on top? I mean, those titles were sort of in the running to be this week's historic announcement prior to the actual historic announcement. The IIconics deserve something for their hilarious promos on SmackDown Live. Or maybe they'll just win those from best friends once again, Bayley and Sasha Banks, at the Australia PPV. The opening segment was mostly a press release on television. It's weird that things like this work seamlessly on NXT but feel awkward on RAW. Is it because of history? That we've seen this same, exact set-up so many times, we're now getting violent visions from years before? Remember that roster walk-out storyline? The many times the Authority opened the show to gloat and annoy us? The many times evil Vince came out to chew out faces? Or maybe it's just the distance between the McMahon family in the ring and the rest of the roster on the ramp that makes everything look standoffish? As for the name of the PPV, it's pretty logical, I guess. WWE wouldn't shut up about the Women's Revolution. Well, that piece of history is now over. It's time for the Women's Revolution to turn into the Women's Evolution. Get it? It helps that Ric Flair's going to be around for that PPV, too, since Charlotte's most likely going to be a part of it. Somehow. We just need stand-ins for Batista and Randy Orton to bring it full circle. But seriously, it's a little meh. I don't know about you, but for me, it doesn't really inspire anything. At least unlike the "Mae Young Classic." Now that's a name. Then again, I don't actually have any alternative ideas in my usually filled idea bucket, so I guess I'll just deal with that like a normal professional wrestling fan. Hopefully, Vince hasn't blocked me on Twitter. I have good ideas, Vince! Someone who had their buckets filled, though, was Finn Bálor. Because he beat Constable Baron Corbin fair and square at Extreme Rules, the Lone Wolf sought to make Finn's life worse by... giving him his own locker room? Oh, wait, that's a child's playhouse. Ha! Of course. Classic Corbin. With Chad Gable's support even after his catchphrase was interrupted, Finn smiled through that jab about his height because it's dumb, causing Corbin to become more upset and book him the dangerous Drew McIntyre. That was the plan, anyway. But then WWE Intercontinental Champion Dolph Ziggler interfered during the match, which lead to a two-on-one beatdown, which led to Seth Rollins making the save, which led to GM Kurt Angle coming out to make his best Teddy Long impression. Holla holla playa. This was, in my opinion, the best match of the night, even though Drew lost again. For the second week in a row. At least he didn't eat the pin, though. That's Ziggler's job. Also Ziggler's job? Defending his Intercontinental Championship at SummerSlam. Apparently, Rollins got another shot at that title for pinning the champ in this tag match. Hopefully, clocks won't be involved this time around. Also at SummerSlam, murderer-on-the-loose Braun Strowman and my best friend in the whole wide world, Kevin Owens, will face each other for the Money in the Bank Briefcase. This, despite Angle's protests. I guess Stephanie values Corbin's endorsement more. But maybe that's just because Angle is obviously a bad GM. Owens is in the right here: Strowman is insane and needs to be reprimanded for various attempts at murder. Just look at what he did to poor Jinder Mahal and one-half of the Singh Brothers. That ain't right, man. The in-ring promo was a tad longer than necessary, but it delivered. Owens continues to be fire on the mic and the humor involving Strowman and Sunil Singh wasn't that bad. 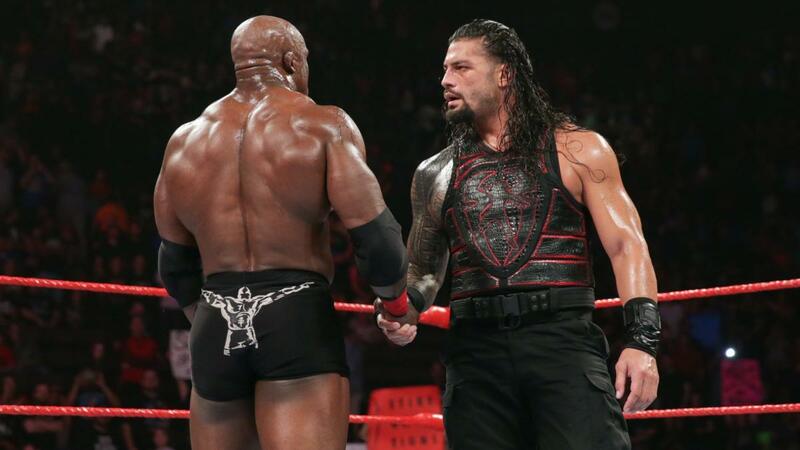 Speaking of one or two common meanings of the adjective "bad," Roman Reigns beat Bobby Lashley tonight to face Brock Lesnar for the Universal Championship at SummerSlam. One word: Why? Just when I thought the Triple Threat rumor was the worst that could happen with this whole thing, something worse actually happened. Then again, SummerSlam is still a long way away. For all we know, the Triple Threat is still the plan. I wouldn't mind that over another Roman Reigns versus Brock Lesnar match, though. We've had a lot of that in recent memory. It's just weird that they gave Lashley the win on Extreme Rules, only to have Roman beat him clean on tonight's RAW. Then again, Vince McMahon. I have good ideas, Vince! This week's Lashley versus Reigns bout actually felt way more important than their Extreme Rules outing. Don't get me wrong: Both matches weren't that bad. It's just that, there was an actual stake with this RAW's bout that makes the PPV match seem less interesting. So why do it? To give Lashley a rub? For what? To extend Reigns' crusade towards the Universal Championship? Fingers crossed the Triple Threat is still happening. It's a missed opportunity to have Lesnar defend against Lashley, though. A towel on a pole match could've been hilarious. Both men are super sweaty. I'll give this week's RAW a D for Da Big Daaaaawwwwwgggg. Ooooooaaaaaaaah!!! WWE RAW Tag Team Champions Curtis Axel and Bo Dallas, The B-Team, retained over the Deleters of Worlds; and then Woken Matt Hardy and Bray Wyatt attacked the B-Team after the match. Meanwhile, The Revival watched this match on a flat screen backstage. Have Hardy and Wyatt turned full heel? Will the B-Team ever get their revenge on them? Tune in next week for when these two teams have some sort of match with each other yet again. Elias got interrupted throughout the show because he has a new album? Noice! O.A.R. isn't that bad, too, but Elias is the best. Elias number one. This recurring segment wasn't that bad. I thought it was a pretty interesting road for the Elias character to stay in everyone's minds without simply having him lose a comedy match. At the very least, it felt a bit fresh. We got an update on the whole Banks/Bayley toxic friendship situation and it was weird af. That's "as friends." Wait, "weird" might not be the appropriate word. Let me try again. It was a complete letdown. I guess they're friends again. Yay. Just in time to be inaugural champions of the rumored WWE Women's Tag Team Championship. I'm still hoping the IIconics win those, though. Maybe Banks/Bayley can do the imploding during that whole storyline, inches from winning those rumored new championships. These "friends" need to deal with their "friendship" by kicking the snot out of each other. At least we're not going with that rumored lesbian storyline—for Banks/Bayley, I mean. The White Ranger Mickie James versus Natalya, with Bliss in James' corner, was a thing. So was Ember Moon versus a Sarah Logan-less Liv Morgan. Two pretty decent matches, no shade. Also no Rousey? Looks like she's actually finally respecting her suspension. Or more appropriately, she's chillin' to make that SummerSlam title shot stick. See, Kurt? It's not even that hard! The Titus Worldwide/Authors of Pain feud continued this week with an in-ring promo that saw Titus and Crews attack AoP. Man, if only the AoP had someone to warn them about that kind of stuff, right? Anybody (Elle)ring a bell? Bobby Roode isn't turning heel, I guess. He's just going to feud—and possibly put over—Mojo Rawley. I'm not sure how I feel about this. On one hand, Rawley's doing good. On the other, Roode ain't. Oh, and Tyler Breeze fought Rawley in the ring. And lost. Again.